This, and The master swordsman. Hey Tim! Thanks for stopping by. Is the master swordsman something short enough to share in comments, or do you have a link? Feel free to share it here, if the spirit so moves you! To Steve Goodheart-off the mark a bit-the point of all Zen stories is that people and their needs are more valuable than any rule(s). Nature (life) presents us with choices on occasion and in deciding which way to go we choose the person. We have stories of thieves and Tanzan would repsond that the thief had stolen nothing and that he (Tanzan) had given the stolen item because no object has greater value than any person. Sometimes life is quiet and during those times we regard the rules quietly and w/o notice. This same idea is presented in the thought that whatever you do to the least of these you do to me. We also have Zen paintings of an incarnate Buddha giving his life to a tiger-the tiger represents the vicious human who might kill. We would even give our life to another if required. An extreme example but an example of deep love toward humanity with no one left out. Hello Mary. Just to clarify, what’s off the mark, the post, a comment here, or are you saying you want to make a related point that sort of “off topic?” Just so I understand—thanks! As for yours point, yes! I agree; koans are skillful only when they help us bring out our deepest humanity and wisdom, and we should never sacrifice a human heart, or person, on the altar of our absolutist ideals. Thanks for stopping by and for your fine contribution to the comments. Hello Taishendo! Thanks very much. I agree that Koans are like gems. 🙂 I’ll have to stop by your blog and take a look. Thanks, Steven. I have read the Koan before in different forms but it still speaks strongly to me. You have reminded me that I need to read, re-read, re-read.. .I think a Koan is like a gem stone. It has different facets and gleams from different angles. Keep up the posts!! And don’t get this joke. What am I missing? Who carried the young girl? Who appears to be more attached to her than the other? 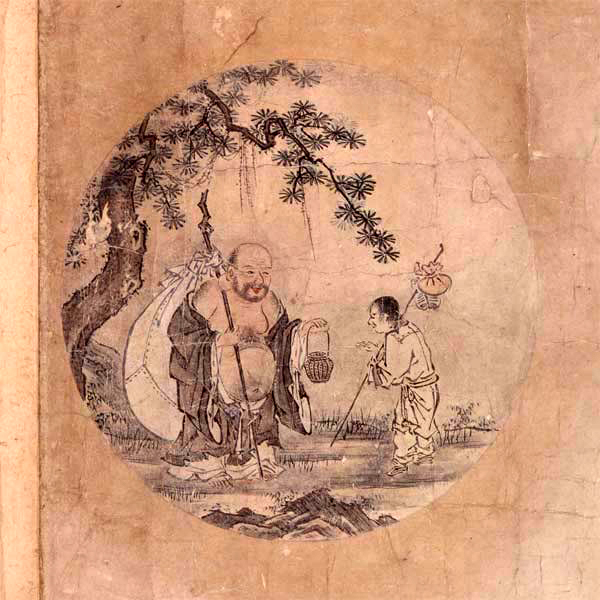 Everyone sees something different in these Zen stories, but for me, the point is that Tanzan responded compassionately, with his heart, even though according to monastic rules, monks weren’t even supposed to look at women, let alone touch– and oh my god, never carry one! Poor Ekido, caught up in monastic views, was astonished the older, wiser monk had actually touched and carried a woman—a woman that Ekido, despite his vows, obviously saw as beautiful and desirable. Tanzan, not caught up in views, monastic or otherwise, had simply responded with his heart. And once he had, he let the woman go, both literally and in his own mind. He wasn’t caught or trapped or attached to his very physical contact to the woman. He had “put her down” and gone on. But dear Ekido, caught up in his “right” views, which apparently were all that stood between him and wrong actions with women, was filled with frustration and outrage. How dare the old monk touch a woman and break the monastic rules? It seems to me that in his mind Edkido had “picked up” the woman in his attraction/aversion to her and was still “carrying” the woman” around in his mind, even though he had not physically carried or touched her. And that’s the “humor” in Tanzan’s gentle response; the irony of who was carrying what around long after the encounter. So, who was more enlightened? The monk who “broke the rules” and compassionately carried the woman, and then let her go in his mind? Or the young monk who would have walked by the woman, in obedience to his monastic rules, outwardly preserving his “purity while inwardly desiring the woman? There’s a koan for you! I love that koan, good job. It took me a while to get it, Steven. I’d call it a good joke, with a serious point to make, of course. By the way, there must be some very funny koans lying around somewhere. How about featuring the funniest ones that you know of? Let’s have some belly-busting Buddhist humour! Thanks, Jan — great suggestion. There’s definitely a lot of humor in the Zen family of Buddhism….in fact, I just came across a Zen humor web site a day or so ago….I’ll have to refer to it here. This “Muju” story is one I selected out of dozens of Zen koans and stories I have collected and archived over the years. I think that if the Buddha never laughed, he would not have been truly enlightened!